I’m now going to talk about equipment for pointed pen lettering in some detail. Most styles of calligraphy use an edged pen – these come in many makes and sizes, but share the quality of having a nib that is shaped like a spade – wide one way, narrow the other. Using this sort of pen, we want the nib to glide across the page, with almost no application of pressure. Pointed pen lettering is different. The tool is – unsurprisingly – a pointed pen. And again unsurprisingly, the nib comes to a fine point. Note – pointed nibs are sometimes smaller than edged nibs, so you may find they don’t sit well in your holder. Personally I’ve always managed to get the nib to sit securely, but if you’re struggling then there are all sorts of holders sold specifically for smaller nibs – I’d recommend a look at http://www.scribblers.co.uk/acatalog/drawing_penholders.html or similar. You may come across oblique holders (and nibs) – I’ve written a separate article about them HERE. There are hundreds of different types of pointed nib, from the very cheap to the rather more pricey vintage nibs. The variations are in the delicacy of the nib (both how narrow it is and how springy it is) and how long lasting we can expect the nib to be. A pointed pen nib always has a split up the middle of the nib, dividing the nib into two pieces (called tines). Under no pressure this slit should be completely closed, making the point of the pen (the bit that will be in contact with the paper) as small as possible. But they are designed to expect the writer to exert some pressure on the nib. When this happens, the tines splay apart, and now the ink is being delivered between the spread tines. Pressure = thick line. No pressure = thin line. It’s easy to be timid with your nib, and press on it only very lightly. This will (probably) move the tines apart, but you’ll be missing out on the range of lines the pen can make. To date, no-one I have taught has pressed a nib so hard that it has broken, and yet that is the worry for everyone. For the lettering we’re going to do we want a nib which is moderately fine and moderately springy. I’m going to recommend 3 that I like, but if you’ve something similar then I’d say give it a try – it’ll probably be fine! (Don’t use a nib that’s caked in ink, or that is really really delicate). I’d suggest you have at least 2 nibs, so you can compare the feel of them, but you can get away with just one handle. Once a pointed nib is worn, (unlike an edged nib which can sometimes be re-sharpened) it’s the end of the road for that nib. But with careful use you should get many months of use from a single nib. If you’ve done some calligraphy before, you may be used to owning nibs of different widths. This doesn’t apply with pointed nibs – one nib does all the jobs – it’s the pressure you apply that gives you the lines of different thicknesses. So we’ve constructed our pen – what about something to go in it? Pointed pens can be used to write with a huge variety of liquids – inks and paints, even food colouring, bleach or pure water. I’m going to steer you away from anything that says it’s WATERPROOF. There are plenty of waterproof inks out there that will write beautifully in your pointed pen, and the resultant lettering will be waterproof. That’s great, but if you let it dry on your nib, yes, it dries waterproof on there too, making it very difficult to remove. Dried ink in the slit of your nib can even damage it, so unless you’re certain you’re going to be super vigilant and always keep your nib clean-clean-clean, then I’d stay away from waterproof. You also don’t want anything too gloopy – it needs to flow off your nib, not cling to it in lumps! And you don’t want anything too runny – it may work well in the pen but there’s a good chance it’ll bleed on your paper. Wow – that sounds like a nightmare! Actually there are hundreds of inks and paints that work well, including all the things you might use in an edged pen. Higgins Eternal is a wonderful black ink, and if you’re not sure, this is what I’d recommend. Ecoline watercolour inks are gorgeous, but pricey if you’re just starting out. Iron Gall ink is interesting – it writes grey but then dries in a minute or so to a deep black. Be careful to clean your pen well when you’re finished because it is corrosive and will nibble away at the metal. I like working with watercolour paint and gouache paint too – just mix to a runny consistency in a little palette and use it in your pen. It’s crucial that the ink does not bleed into the paper – all our efforts to create delicate lines are wasted if the ink oozes into the paper and you end up with furry caterpillars where your gorgeous lines once were. The good news is that most cartridge papers seem to work well. Some people like layout paper – I find it a little to slidy and flimsy, but you might find it to be fine. Cheap photocopy paper tends to be a bit porous, so the ink bleeds – but the slightly heavier weight paper can be great. I would recommend a lightweight cartridge paper to start with – good for practice and for those early finished pieces. Great – the nib’s in its holder, we’ve got paper and we’ve got ink – all good to go! Quick thought – how do you get the ink into the nib? Have you heard them called dip nibs…. ? Certainly dipping the pen into the ink is a good way to get it filled – just make sure that the first mark you make doesn’t cause a big puddle of ink to come off the pen. You can avoid this by making your first mark after each dip on a scrap of paper, or by wiping the excess ink off the top of the nib with a piece of cloth or kitchen roll. Personally I prefer not to dip my nib in the ink. 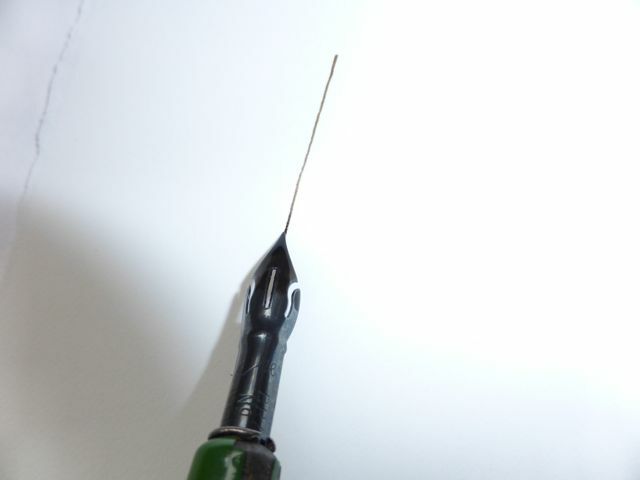 Instead I load a brush with ink, and brush the back of the nib only – this gives me plenty of ink, without any excess. I often hold the loaded brush in my non writing hand so I can refill easily when I’m ready. 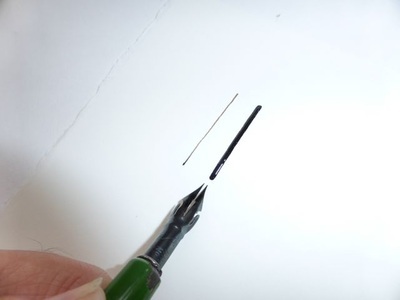 This loading with a brush is the way you’ll need to do it if you’re mixing watercolour or gouache – unless you’re going to mix so much that it gives you a deep enough pool that you can dip the nib in. Do you remember in lesson 2 we did some exercises to get used to adding pressure to our lettering strokes? We’re going to do exactly the same but with our pen and ink. Notice in the video that if I drew a line up the middle of my nib, this would be parallel to the downstrokes of my letters. This is crucial. If you don’t hold your pen in this way, you will not be able to achieve the thick strokes on the downstrokes of the letters. There are several ways you can achieve this (Right handers). The easiest is to hold your pen so that it’s comfortable in your hand, then rotate your writing page until the line of the uprights of your letters is aligned with the slit of the nib. This might mean that your writing line is running from 7pm to 1pm on a clockface, instead of the 9pm to 3pm that you’re used to. If this just feels too weird, try also turning your wrist a little, so that the end of the pen is pointing to your right shoulder, or even your chin. Again line the page up so that the uprights of your letters are parallel to the slit of the pen – the writing line should be closer to what you’re used to now. 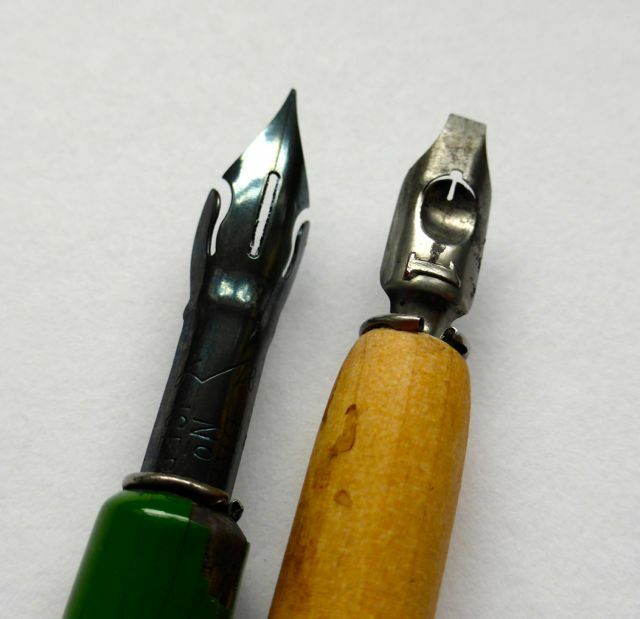 The third option is to try an oblique nib or holder – see here. This should allow you to have the writing line horizontal. Lefthanders – this is one of those rare rare occasions where the leftie has the advantage. 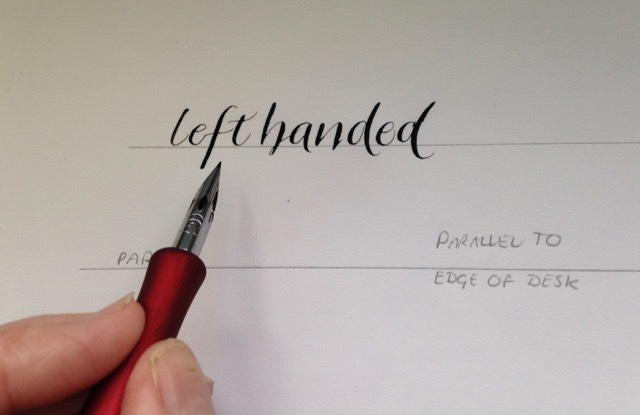 Like our right handed friends we need to hold the pen so it’s comfortable, and turn the page so that the upright of our letters is parallel to the slit of the nib. This is likely to achieve having the writing line pretty much horizontal. Now you’ve had a think about aligning the pen properly to the page, maybe have another go at the exercises and see if you can get really thin thins, and nice inky thick strokes. Just as we did with the pencil, we can apply the rule : – across or up the page – no weight. Down the page – add weight. We’re going to rule the lines 1cm apart again, but this time we’re lettering with the pen. We’re going to start with my alphabet, as we did with the pencil. You might be wondering how much weight – well, it depends what look you’re wanting. I’d say for now, apply enough pressure to make sure the thick strokes are obviously thicker, but you’re not putting the nib under maximum strain. You might also be wondering how fast to write. There are very few calligraphers who can write their lettering as fast as we would write handwriting. For almost everyone calligraphy is a slow activity, with careful shape making and working to keep the letters consistent. That’s enough wondering – time to give it a try! Remember your alphabet? Why not have a practice of those letters too – you’re getting 2 pointed pen alphabets for the price of 1 in these lessons! and send both alphabets to me so I can have a look at how you’re getting along. Don’t forget to let me know how you’re getting on – it’s much easier to know how to help if you’ve described what’s working and what isn’t.